Congenital Scoliosis: present at birth, although it may not immediately be identified. Scoliosis is a musculoskeletal disorder that adversely affects the shape of the spine (backbone). A scoliotic spine (when viewed from behind) will not be straight and may instead look like the letter "C" or "S", due to a side-to-side (right-to-left) curvature. Congenital means the scoliosis is present at birth. A congenital condition is present at birth because of a problem during development. For congenital scoliosis, the abnormal curvature of the spine develops before birth. This is thought to occur early in fetal development (during first 4-6 weeks). Although congenital scoliosis is present at birth, it may not be discovered until a child grows. Compared to idiopathic scoliosis, the abnormal curves in congenital scoliosis are generally more resistant to correction. It is estimated that between 10-25% of congenital scoliotic curves will never progress (get worse). Unfortunately, the majority of congenital scoliotic curves do progress (get worse) and require active treatment. Generally, scoliotic curves tend to progress (get worse) only when a child grows. It is unclear as to how frequently congenital scoliosis occurs (i.e., its incidence rate). However, it is much less common than idiopathic scoliosis. Finally, unlike idiopathic scoliosis, congenital scoliosis does not run in families. Formation failure means that one or more bones of the spine (vertebrae) are incompletely formed during fetal development. These incompletely formed bones are abnormally shaped compared to completely formed vertebrae. These bones have the appearance of a triangle or wedge and, therefore, may cause the spine to tilt in the direction of the wedge. This is how they can cause a scoliotic curvature of the spine. The presence of malformed bones does not necessarily result in a scoliotic curve. For example, two wedges on opposite sides of the spine may balance each other out. However, if both wedges are on the same side then the abnormal curve will be accentuated. This is also referred to as separation failure. Segmentation/separation failure means that some of the bones of the spine (vertebrae) incompletely separate from one another during fetal development. This causes the bones of the spine to be abnormally connected (fused) to one another on one side of the spine. This connection (called a boney bar) causes the two sides of the spine to grow at different rates—slower than normal on the connected side—and results in an abnormal curvature of the spine. It is possible for both wedged shaped bones (formation failure) and connected bones (segmentation failure) to be the cause of congenital scoliosis. This is referred to as a mixed deformity. The above developmental defects of the spine can range from mild to severe and they can affect one or multiple areas of the spine. The degree to which these occur will determine the severity of the scoliotic curve, the symptoms, as well as the requirement for treatment. Often congenital scoliosis is detected during an examination at birth. However, if it is not detected at birth, it can remain undetected until there are obvious signs and symptoms, which may take years. Children with congenital scoliosis often have other health issues. There is a fairly high rate of other spinal deformities (like lordosis and kyphosis) in children with congenital scoliosis. Other skeletal problems may coincide with or be related to congenital scoliosis. For example, rib abnormalities (missing and/or fused ribs). If the ribs are fused this can adversely affect the shape of the chest and ultimately the ability to breathe normally; this condition is known as thoracic insufficiency syndrome. Children with congenital scoliosis often have other non-skeletal health issues (e.g., bladder and kidney problems). How is Congenital Scoliosis Diagnosed? This includes an interview with a doctor and a review of any medical records. These are done in order to determine the presence any medical conditions that may be causing the spinal curvature. A thorough examination will be performed to determine if there are other congenital abnormalities. Children with abnormal spinal curves and/or signs of underlying medical conditions will need imaging studies. 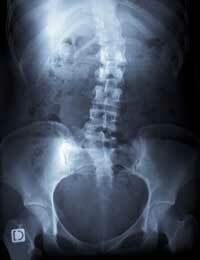 These may include X-rays, CT scans, or an MRI of the spine. Which of these imaging studies will depend on what conditions are suspected to be involved in causing the scoliosis. An abdominal ultrasound is frequently used to examine the internal organs of children with congenital scoliosis.